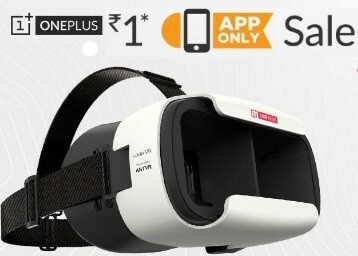 Loot Offer : Script and Trick to buy OnePlus Loop VR Headset at Just Rs 1 only on Amazon App. Amazon Offering OnePlus made available 30,000 units of the VR headset on its website for free (alongside a nominal fee), and needless to say, they were out of stock in no time. It isn’t sure whether OnePlus will refresh the stock or not, though Pei said several orders are still pending due to payment, and may yet be cancelled. The company has also made the headset separately available for its Indian fans, which can be procured from Amazon after they register for it. It will be sold in an app-only sale for Rs. 1 on June 3 and June 7. Open it before 3rd june 12 Pm and again At 7th June, 12 PM. Must login Amazon App with subscribed Account. Continuously click on Add to cart when sale starts. If you are from 1 of the first 30000 customer you will obviously get it. If OnePlus loop VR headset added to a cart complete checkout within 15 minutes. Loop VR turns your smarthphones into a private, 360 degree 3D theater, and there’s no disposable cardboard here. The headset is built out of robust materials for the ultimate visual experience. For a distoration-free field of view, lenses can be fine-tuned for a perfect focus. Comfort is the name of the game thanks to adjustable straps and snug inner-padding. The Loop VR fits comfortably over glasses, so that everyone can join the party. If the Original Buyer fails to complete the orders within mins, the Loop VR Headset will become available to the customer in the waitlist. IF waitlisted, an alert will pop up notifying when a Loop VR Headset is available. Only orders placed from amazon.in or the product page on the deal widget will be succesful. Orders from wishlist, customer reviews and all other platforms/functionalities have been disabled. Only one device is permitted per customer. Loop VR turns your smartphone into a private, 360° 3D theater, and there’s no disposable cardboard here. We’ve built our headset out of robust materials for the ultimate visual experience. For a distortion-free field of view, lenses can be fine-tuned for a perfect focus. Comfort is the name of the game thanks to adjustable straps and snug inner-padding. We also made sure that Loop VR fits comfortably over glasses, so everyone can join the party. Dimensions – 188 x 120 x 100 mm. Field of view – 100 degree. Compatible with most 5 to 6 inch smartphones.